Tokyo Institute of Technology (Tokyo Tech) will launch the Institute of Innovative Research (IIR) on April 1, 2016 to enhance international collaboration in emerging and interdisciplinary research fields. The new institute consists of about 180 researchers affiliated with four research laboratories, two research centers, and ten research units. Tokyo Institute of Technology launches Institute of Innovative Research to promote international interdisciplinary collaboration. Tokyo Tech welcomes enquiries for potential collaboration from researchers overseas. Tokyo Institute of Technology (Tokyo Tech) will launch the Institute of Innovative Research (IIR) on April 1, 2016, to enhance international collaboration in emerging and interdisciplinary research fields. The new institute consists of about 180 researchers affiliated with four research laboratories, two research centers, and ten research units. Research units will conduct cutting-edge research in small teams under the leadership of prominent scientists. Areas covered will include cell biology, global hydrogen energy, nuclear fuel cycle, and clean environment. Research at the IIR will build on Tokyo Tech’s internationally recognized contributions in areas such as materials science, supercomputing, and life sciences. The IIR underscores Tokyo Tech’s commitment to innovation and international collaboration. The IIR is organized into multiple research laboratories, research centers, and research units. The IIR is led by its director-general who reports directly to the president of Tokyo Tech, thereby enabling efficient and timely decisions about hiring, funding, and launching new projects. 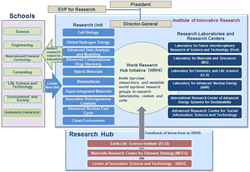 The IIR also includes the Tokyo Tech World Research Hub Initiative (WRHI), inviting world-class scientists, as well as those from overseas, to set up research projects at the institute. FIRST is dedicated to fostering future development and prosperity for society by promoting technical progress in industry to meet needs of the era. FIRST creates innovative industrial technologies by fusing mechanical engineering, information science and technology, electrical and electronic engineering, metallurgy, environmental engineering, disaster prevention engineering, social engineering, chemical engineering and materials science. MSL aims to create innovative materials with unique properties and functions via interdisciplinary materials science based on inorganic materials extending to metals and organic materials. CLS consists of four major divisions, molecular synthesis, molecular materials design, molecular functions, and molecular bioscience, and carries out a wide range of research on molecular science and engineering, covering not only fundamental and applied chemistry but also life science. As one of the top laboratories leading the applied research as well as pursuing the scientific principles related to nuclear energy, LANE aims to contribute to the sustainable development of the world. We aim to establish advanced energy systems to realize stable and environment-friendly energy utilization by taking advantage of existing social infrastructures related to energy. ASIST aims at solving social problems by utilizing Information and Communication Technology (ICT). These units will conduct basic, cutting-edge research in small teams under the leadership of prominent scientists. This unit aims to investigate the structure and function of cells through the observation and hands-on manipulation of cells, and to use this improved understanding in the creation of cells with unique functions. Implementation and technological development of a global-scale CO2-free hydrogen supply chain combined with the domestic hydrogen network will be investigated, with collaboration between academia, industry, and government, aiming to realize a “best mix” of global and diverse energy resources. Our society is facing multifaceted problems that we expect to be able to solve by utilizing big data. We aim to establish an academic and open innovation drug discovery platform by taking advantage of complementary capabilities of biochemical experiments and computer-aided drug discovery. In this unit, we create sub-nanosized alloy particles with a fractional atomicity by making full use of the precision metal assembling method. This research unit will build a flexible organizational structure to carry out leading-edge medical and health technology research. We are working to create “supra-integrated materials” fabricated in nano/micro scale by integrating various molecules and/or nanomaterials with their programmed interactions, going beyond conventional hybrid materials achieved by simply combining component properties. Various catalysts have been developed resulting in the production of chemicals that are essential for modern society. However, environmental problems that have not been solved by such catalysts remain. The aim of this unit is to solve these problems by creating new heterogeneous catalysts. In the Nuclear Fuel Cycle Research Unit, we are developing safe, low-emission, and eco-friendly nuclear fuel cycle and nuclear waste disposal technologies. These technologies will contribute to the early suppression of global warming, future energy security, and decommissioning of the Fukushima Daiichi Nuclear Reactors. We are developing various methods to evaluate environmental risk which are indispensable to establishing a safe and secure society. Advanced methods include real-time monitoring of chemical components in exhaust gases from vehicles and incinerators and analysis of origin and migration of environmental particles (SPM).